Nothing says summer quite like fresh watermelon. Then you add coconut and it's game over. 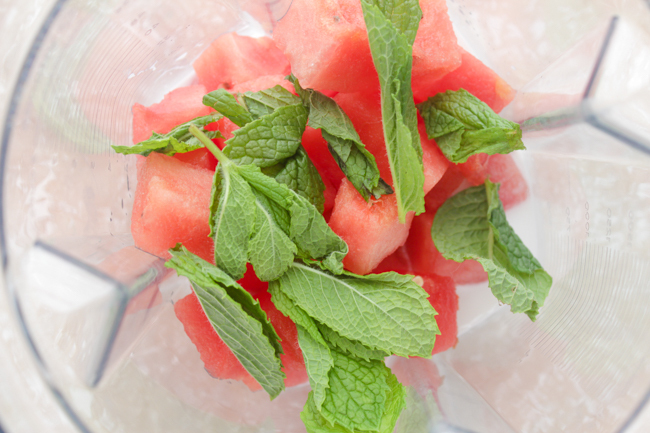 Watermelon is right up there with all the best parts of the season like picnics, camping and warm nights. 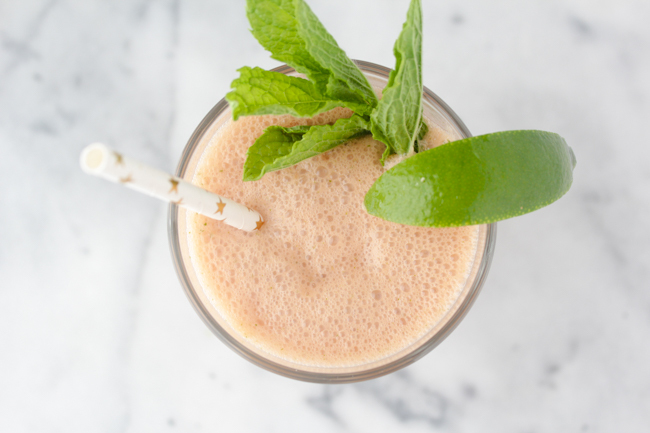 This smoothie is a mix of watermelon, coconut, mint and lime and it's a combo I really can't get enough of. It not only feels festive but is also super hydrating (watermelon is 92% water), which is so important when you're spending time in the sun. You know another time this hydration comes in handy? When you're looking for a new cocktail recipe that won't leave you feeling bad the next morning. Because really there's no time to waste feeling hung over when it's this beautiful outside. 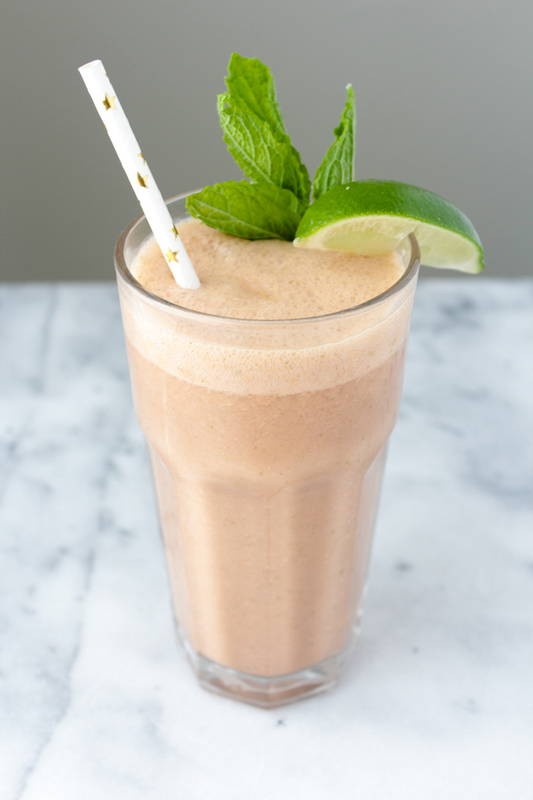 This smoothie is delicious mixed with coconut rum or silver tequila resulting in the most refreshing drink to cool down with on a hot day. This year for 4th of July, Jack, two other couples and I rented a beach house in Half Moon Bay and I've been trying to think of fun food and drinks we can make in its beautiful kitchen. This watermelon smoothie/cocktail definitely makes the cut along with a recipe for strawberry and pineapple guacamole that will be coming up on the blog next week. - Place everything a blender and whiz until smooth. Yummm! 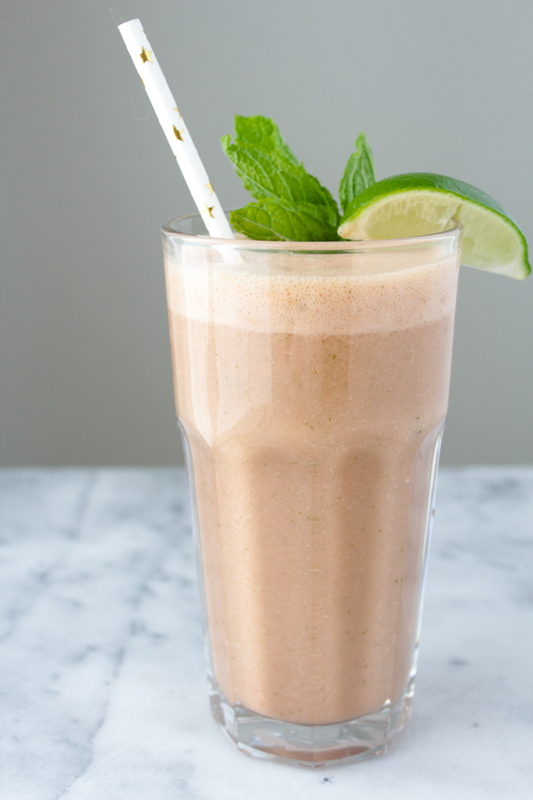 This sounds so refreshing for summertime! And a great way to start the day too! 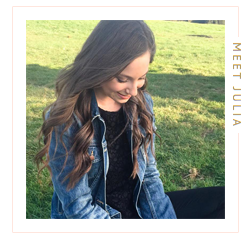 Omgosh Julia how do you do it every time?!?! Seriously I am just as obsessed with watermelon these days as you are. Have you ever tried Watermelon water?! I literally buy it every time I'm at WF bc it's soo good. 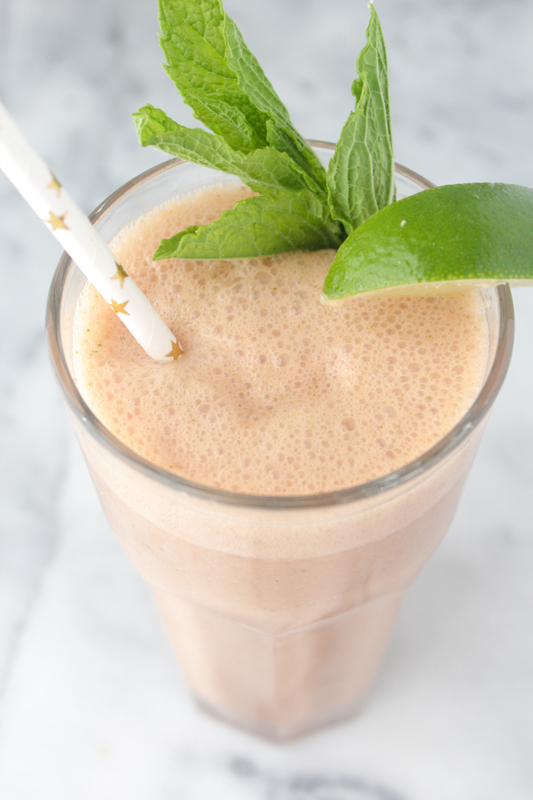 I will def be making this smoothie next week! Hahaha you're comments always make my day!! I am obsessed with watermelon as well, I seriously can't get enough. I haven't tried watermelon water though! Is it near the juices in WF? I am definitely going to look for it when I go this weekend! UHM, this sounds heavenly! I love watermelon and this just looks so refreshing! And I giggled at the Coconut Rum or Tequila (optional/encouraged) haha! Hope you have a great weekend! Haha right?! It's the most refreshing summery cocktail ever basically. Then you add some rum or tequila and its game over. Thanks for stopping by, Lily! This looks delicious! I've never tried coconut yogurt, but once again you've inspired me! I didn't really get into coconut yogurt until recently, but it is so good!! I was never a fan of normal yogurt when I ate dairy, but coconut yogurt is so delicious. I hope you try it and let me know what you think! I never thought of throwing the 2 together. Looks delish ! They compliment each other so nicely! Yummmm this sounds so refreshing and delicious! And looks so easy to do, thanks for sharing the recipe! Thanks, Tamara! :) It's definitely all of those things! Yumm! This is so perfect. What would you suggest to replace melon with? It does work very well for me, but everything else sounds absolutely delightful! Strawberries would also be delicious! 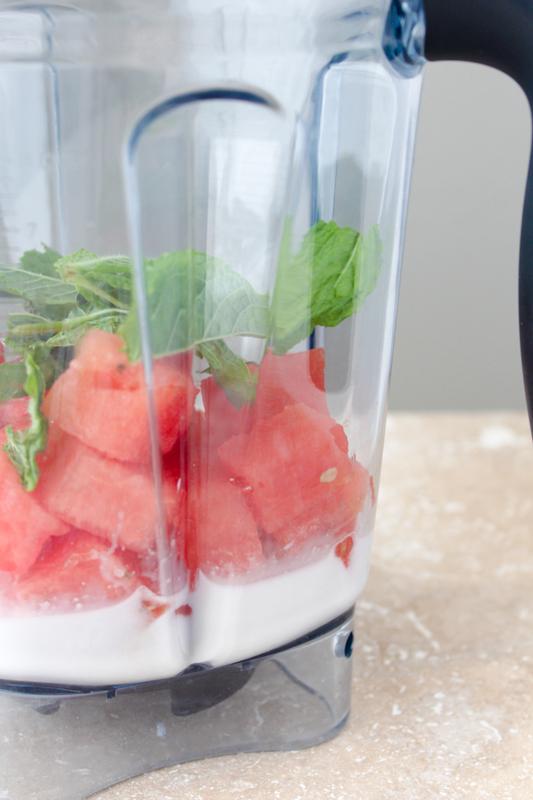 I've never thought to mix coconut milk with watermelon - this sounds delicious!! I am obsessed with watermelon so obviously I have to try this out!! Can't wait! I would have never thought of mixing watermelon and coconut! What a great (and very refreshing) idea!!! Thanks! It really is a such a refreshing and delicious combo!